Sooooo I totally interrupted this trip report with a trip report of my WDW Marathon weekend trip. Let's jump back to the December 2017 trip, cool? If you need a refresher, you can see all the posts in this report here. I have been trying - and failing - to book a Dining with an Imagineer reservation at Sanaa for years. I'm especially desperate when my mom's coming to WDW with me, as she loves animals as much as I do. Alas, no dice. The stars have never aligned for me. 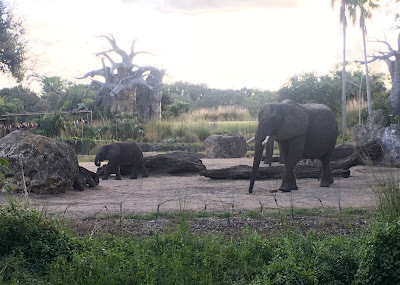 Lucky for me, a new animal experience at Disney's Animal Kingdom dawned just as I was starting to make my plans: the Caring for Giants tour, featuring a backstage viewing of Disney's elephant herd. With tickets in the reasonable $30 area, I signed us up without hesitation. 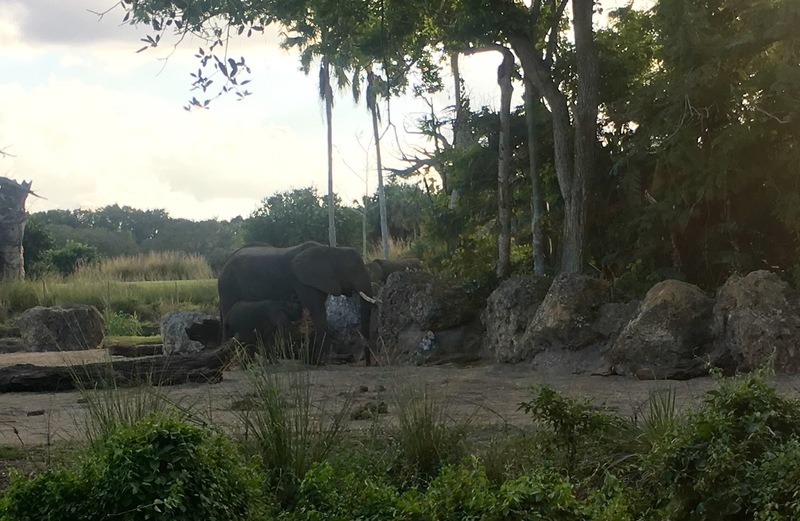 Our journey began at the check-in desk near Kilimanjaro Safaris, across from the fruit stand. 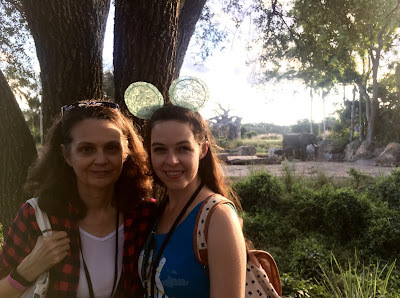 We were given lanyards with name badges on them and signed a waiver that basically stated that if we were up to and including trampled by the elephants it would not be Disney's fault. Not that we would be getting anywhere near them really but I'm sure Disney's lawyers nurse a healthy paranoia about life, the universe, and everything. I had signed us up for the last tour of the day, and there were only two other people accompanying us. A Cast Member escorted us backstage with the strict admonition that we not take any photographs. Not that there was a ton to see from a strictly aesthetic perspective, but as a WDW enthusiast it was nifty to observe the goings on. We were loaded into a van for our trip down to the elephant area; as we drove our CM driver regaled us with some elephant facts - things like how much elephants eat (lots), how long they gestate (long), etc. Our guide assured us that we are the only groups allowed down this particular road to the elephant viewing area aside from relevant employees. There was a brief delay when a maintenance truck was found to be blocking our path, but they soon cleared out. The reason for their presence was soon apparent, however; as we drove up to the viewing platform we saw a busted water pipe right by the enclosure gate. Several of the elephants, being intelligent and inquisitive creatures, were supervising the work. Happily for us, they weren't all enthralled by the plumbing. We ascended the viewing platform and were greeted by... oh shoot. I'm pretty sure the mother elephant we saw was named Donna. I know her baby was Stella, and another one of her more grown daughters was there - Luna. Stellaluna! We had a lovely vantage point on the opposite side of the savanna from where the safari ride trucks drive through. Stella was of course adorable, nursing and then wandering about. Donna and Luna munched hay and hung out for the most part, although by the end of the tour we had lost them, too, to the fascinating maintenance work. We were then handed over to a CM who was if I remember correctly from Namibia. She told us a bunch of stuff about elephants' part in the ecosystem of the area. Evidently they are not super popular with farmers, as they are known to both steal and trample crops. In an effort to scare away the elephants without causing them harm, the latest tech is... bees! 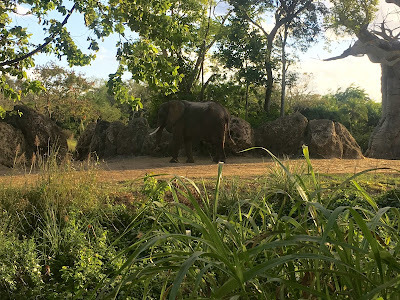 Yes, elephants fear bees, and so a trip rope fence can be installed around crops; when the elephants jostle the rope, the bees come out and scare them away. Plus the farmers can collect the honey, so win-win! After a bit more elephant viewing and some photos, we were given elephant pins and bused back to the park proper. All in all a very satisfying experience. A few days later I received a survey from Disney specifically about this tour and how valuable I found it. Obviously I said very very - but I would strongly encourage anyone reading to book it, too. 100% of the proceeds go to Disney's conservation fund, and we want to encourage them to continue doing that! Plus they could add tours for other animals, too, which would be awesome. Have you gone on any of DAK's tours? Thoughts? Don't forget, you can follow us on Twitter @fairestrunofall. If you have any questions for us, leave a comment or email us at fairestrunofall@gmail.com. See ya real soon! Loved this tour! I'm also surprised you haven't been able to get Dine with an Animal Specialist. The day that I did it, I was literally the only one there. It was like a private date with me and my new BFF Emilie. I think it might only be offered two days a week - maybe that's why? Oh, lucky! Hmmm, I'll have to try again next time. I don't seem to have much luck with the Imagineer lunch either.